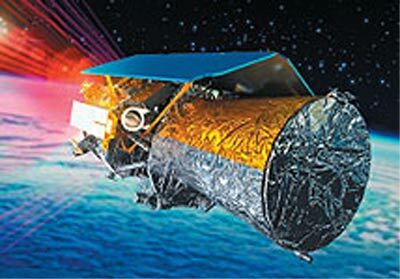 NFIRE (Near Field Infrared Experiment) was an experimental satellite by the Missile Defense Agency (MDA), which was launched in 2007 and was designed to distinguish between a ballistic missile's fiery plume and the rocket itself. Data from the Near Field Infrared Experiment will helpes validate the MDA's choice of kill vehicles and tracking sensors for boost-phase missile defense, and help improve the guidance and homing ability of ground-based interceptors. Spectrum Astro of Gilbert, Ariz., built the satellite under a contract of up to three satellites for the MDA. The missions were to cost about $65 million each, not including launch. MDA did not pusrue plans to build an operational constellation based on the Near Field Infrared Experiment satellites. The MDA built and place one satellite into a low Earth orbit during 2007 to track targets launched from Vandenberg Air Force Base, Calif., and will conduct experiments over a one-year period. MDA's firm plans cover the purchase of only the first satellite. Discriminating between a missile and its exhaust plume has long been a point of difficulty with boost phase missile defense, according to an industry source familiar with the planned experiment. Problems distinguishing between the two can cause an interceptor to be fired at the plume, rather than the rocket. MDA launched two Minotaur-2+ ballistic missiles as part of a 20 km fly-by test and a 3.7 km fly-by and simulated engagement. The primary payload is the Track Sensor Payload (TSP) which was used to collect the images of the boosting rocket. The TSP was developed by Science Applications International Corporation (SAIC) of San Diego, California under contract to the Air Force Research Laboratory at Kirtland Air Force Base, New Mexico. The secondary payload was a Laser Communications Terminal (LCT) which was used to evaluate the utility of laser communications for missile defense applications. The LCT was developed by Tesat-Spacecom and was provided by the German government as part of a cooperative agreement between the United States and Germany. The NFIRE payload was originally to include a sensor package using the sensors of a generation 2 kill vehicle for the 3.7 km engagement that was reportedly hit to kill. The NFIRE-KV would not include an axial stage that would be necessary for engagements at realistic distances, although the FY 2005 budget requested funding to develop and test such a liquid axial stage. In the launched configuration, the KV would only be able to intercept targets launched directly towards the NFIRE spacecraft. Later, the Kill Vehicle was cancelled and replaced by a laser communication package. NFIRE was formally retired in September 2015 and reentered the earth's atmosphere on 4 November 2015.